...on April 7, you'll finally get a chance to behold the rest of her -- when our very own Blondie will grace the cover of Woman's World magazine for a story on the No S Diet. The story will also include interviews with (and photos of, I believe?) two other longtime no-essers: Josie and Silverfish. Women's World has a circulation of about 1.5 million (more than the New Yorker, Self, and Vogue, among others), so more people will probably see this article than have EVER come to the site so far. This is a huge deal for no-s, and I'm deeply grateful to Blondie, Josie, Silverfish, and everyone else who submitted photos and stories (back story here) -- I got a crate of advance No S Diet books last week and will be sending your signed copies out this weekend. THANK YOU! Last edited by reinhard on Fri Jun 20, 2008 3:01 pm, edited 1 time in total. The nice thing about Woman's World is that it is located at the checkout in every grocery store and Walmart in the country. What great exposure! Congratulations! This is wonderful news Reinhard, congratulations to you! I love Woman's World. I have the honorable distinction of buying every one of their copies that contains a new diet......and that's every single issue (oh no I'm just kidding about the "every" but I've sure bought my share). The next issue will be my favorite, that's for sure! If I don't keep track, I lose track. You must be so proud! You have really dedicated yourself and your time to helping others find sanity in eating and you truly deserve this. I got my book in the mail. Will the magazine come out April 7th or is that the date on the mag? I forgot to add...congrats Blondie! I can't wait to see it and I am so glad you will be getting such widespread exposure!!!! I believe the date is April 14 but it'll appear in stores April 7th. Very happy you liked the book! I know the book hasn't even officially been out a full day yet, but if there are any fast readers among you who want to be the first to write a review on amazon, I'd hugely appreciate it! It is one of my policies this year to Not Be Embarrassed (much), so that was put to the test while I was having photos taken in front of the lounge room cabinet and all my housemates, who had been watching the tv inside it, were still sitting around watching me pose! Also, my zipper broke, but I still managed to be pretty cool and the photographer ended up staying afterwards to watch Top Gear! Unfortunately the Woman's World editor just emailed me that they won't be able to release the cover image until it hits the newsstand. So I'll have to distract myself till april 7th hitting reload on amazon and obsessing over my "sales rank"
Actually, supposedly the LA Times is going to mention No-s in an article on "hot diet books" on March 10, so I'll have *something* to feed my newly frenzied media appetite in the interim. I cannot wait to get the issue in April. How exciting for you. What a gift you have given people. Heath starts in our heart and mind. I'll be eagerly awaiting the article. I can't wait to see other successful No Sers. I hope you post a link to the LA Times article too (it's hard to get here in rural Florida). someone said it was out today, but it isn't april yet? I'm pretty sure it's not out yet.... if someone does see it, please let me know! The editor promised me a cover image I could post here and I want to make sure I get it as soon as it's available. I just picked up a copy here in the Baltimore suburbs!!! Very nice. Very exciting! I liked the article. Short and simple, kind of like the diet. The headline says, No Willpower No Problem!! I don't know that I agree with that. It does take some willpower to stick to No-S. I was in Walmart yesterday and just happened to see Woman's World while standing in the check-out line. Bought it because of your article...never heard of No-S Diet until yesterday and already I am excited and telling my friends about this great new way of losing weight and getting healthy again! reinhard wrote: The editor promised me a cover image I could post here and I want to make sure I get it as soon as it's available. Is there any chance that the publishers might be persuaded to let you post the article (or a link to it) on the website? I can't get the magazine in the UK, and there must be a lot of other NoSers in the same position. I've been looking around for it for a few days now when I'm out shopping. Glad the word (and I'm sure sweet pic of Blondie girl!!) will be spread to a large audience!!! I picked up a copy of Woman's World yesterday and today is my first day on No S. It's a lot like what I did to lose a lot of weight a few years ago, but then got caught up in a lose it fast mentality and sabotaged my efforts! Well, it's time to get back to losing. With the publicity your membership should grow exponentially, Reinhard! Never start a diet you can't live with the rest of your life. "No willpower? No problem!" is not quite the headline I would have picked, but I'll choose to look at it as an oversimplification (clear rules leverage limited willpower to build self sustaining habits) rather than a falsehood. Can't whine about free publicity. I wish I could post the article itself... There's some standard dietese about "melting flab" and "dropping pounds" (some of which unaccountably found its way into direct quotes!) but the basic tenets and appeal of the diet come through. It's a fully two page spread with a picture of the book and a prominent link to the website. There's also a very nice picture of the lovely Silverfish -- right next to FIVE HOLLYWOOD ACTRESSES who unbeknownst to me (or themselves, probably) have been incorporating elements of no-s into their fabulous lifestyles. Welcome, ToutDeSuite! The day's barely begun and I think we're close to our record for daily new members already. I think it's only going to increase as we approach the 7th (I hadn't expected anything before the 7th --the issue is dated the 14th). By the way, I totally don't think this picture looks like me--I feel like the make-up looks caked on and gave me wrinkles!! My coworker busted into my office with all the copies from the gift shop, and I gave him a bemused smile and said, "oh, that's the wrong issue, that's not me...oh, wait...wow, that IS me!" I think the article got the spirit of No S mostly right, though with a little irritating "miracle diet" flavor thrown in (including some vaguely misquoted statements by me, which I could feel happening at the time of the interview!). What I found interesting is that there is no mention of NWS days (althought one of the celebs hints at it--Jessica Biel maybe?). Alas, I think you'd have to do some kind of "bible code" interpretation of her words to arrive at that. Oh well, gotta leave SOMETHING for us to educate people about here. Congratulations, Reinhard, Blondie and Silverfish! Who are the FIVE HOLLYWOOD ACTRESSES, then? Sandra Bullock, Angie Harmon, Drew Barrymore, Debi Mazar (? ), and Jessica Biel. Drew Barrymore's thing is fake sugar, though. Wow Mandy you look amazing!!!!!!!! Great pic and really good and positive vibes come through in your face!!! You will definitely help people who are on the fence to check out NoS lookin like you do here!!! Mandy, you really do look *amazing*-very inspiring!! I can't wait to get a copy of this myself! on your WW's article. Prepare for the deluge! Your plan sounds fantastic (and so simple, yeah!) I'm going to try it, I love the idea of no snacking (guilty), no seconds (guilty guilty) and no sugar (don't ask.) I'm also contemplating a sledge hammer purchase, thankfully I have no cats to kill. Reinhard, you crack me up. Thanks, Deb (good to see you around here!! ), jaxhil and Too Solid Flesh (and Reinhard). I took all the copies my coworker gave me and hid them. And I haven't told my family. Ha. I'm a dork, but I'm embarassed! Blondie, you are absolutely lovely! You should frame the cover and hang it up. And if I were your mom or sister, I'd be mad if I couldn't have some copies, too! Agreed with the sentiments that Blondie looks great! Now the tricky part, since I'm a guy, I might get funny looks if I browse this magazine, so maybe I'll go into the grocery store in drag just so I can check out the whole article. Before criticizing someone, you should try walking a mile in their shoes. Then you'll be a mile away and you'll have their shoes. Who is our other gorgeous NoEsser? Kathleen, I don't know your user name, but you look great too. It's a good day for NoS Diet. I'm so happy for Reinhard and also for Mandy and Kathleen. The article seems to have barely scratched the surface of all the greatness of NoS, but I'm sure many people will be checking out this site. Come on Mandy thats silly!!! You look so fantastic!!! Really girl!! Not just sayin to be nice okay?? One thing which kinda made me laugh was the thing about boost your metabolism 14 percent! Reinhard!! My metabolism isn't boosted yet! Also, why do they say the "No Diet" Diet and not the NoS diet??? Have a great weekend all! ps.. Hi Dru and Nathan! PS.. I'm looking forward to seeing Silverfish too!!! Wow! The pic is awesome!! Was a little sad to see the S omitted and the "eat *all* you want all weekend" but otherwise it looks great! Yahoo!! Vanilla NoS... Making good habits. I was at Walmart yesterday night, standing in line and saw the article in Women's World. I came home and got on the website. Wow! if this isn't a slap in the face to get motivated -- nothing is. I am new too ... almost two weeks! I was/am sick of being fat. I had already decided just this weekend to eat healthier. So, this morning I went grocery shopping; bought fresh fruits, salads, fresh veggies, whole grain pastas and bread instead of white, etc. THEN, in the check out line I see the current copy of Woman's World. I saw the headline and thought, shoot, why not check it out. I read the article, and thought, this is something I can do. No calorie counting, no food restrictions (other than the 3 rules). So beginning tomorrow (Monday) my daughter and I are both starting the no s plan. Great article, by the way! I understand this must be weird, Mandy, but 1) you really truly, sincerely do look gorgeous and 2) if your mother finds out you were on the cover of a national magazine and DIDN'T TELL HER, she's going to kill you. It's amazing to me when I think that only last week I would have been grateful to get a "celebrity endorsement" from an extra on star trek, and now I've got half the hollywood pantheon as my "disciples." I have NO IDEA where they got that statistic from, Deb. (but hey, it's got my favorite arbitrary number in it). Oh, ok...so I told Mom. Mandy you look gorgeous. I am sure your family will be thrilled for you. I am frantically casing every stationer and super market in SA to see if I can find one that brings in Womans World to be able to read the article and see Kathleen. I buy Womens' World every week but this week when I read about the No S Diet. I decided I have to try it. I have tried everything else and I yo yo up and down but this seems doable. Today is my first day. I hope this works for the. The testimonials were really encouraging. 2) they seemed to have changed my eye color. My eyes are blue in real life--I guess they look dark here? Is there a reason why you can't? I'd love to see the article, but this magazine is not available in Europe. Glad you took the plunge and showed mom and dad, Mandy! Even if you are not able to post it on the web, would they maybe allow you to email it to people not living in the US? Otherwise I am just going to have to find someone with paypal that I can pay to buy a copy and post it to me here in SA. MerryKat wrote: I am just going to have to find someone with paypal that I can pay to buy a copy and post it to me here in SA. And to me in the UK! Wait a minute... isn't the title Woman's world?? If so it ought to be available everywhere! I think they're using "world" in the sense of "world series." 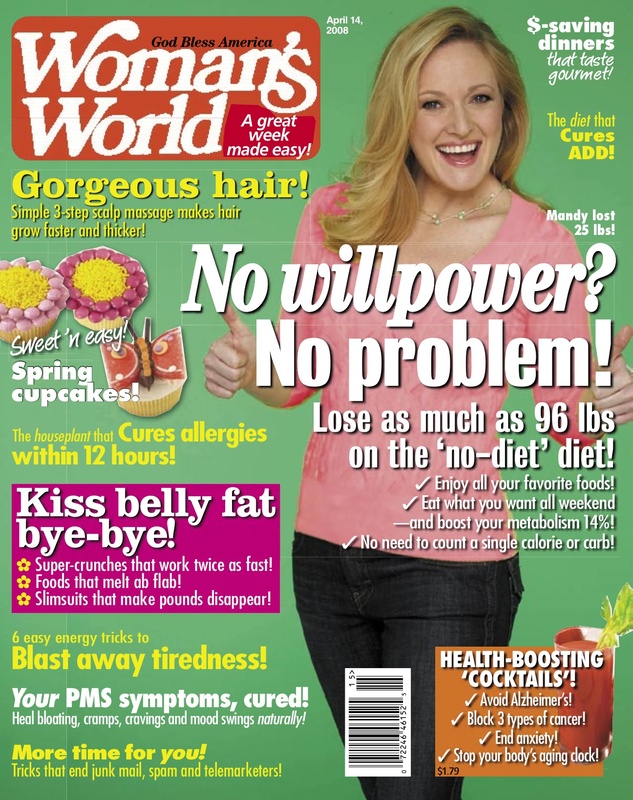 Everyone: you know you're going to go to the grocery store, so buy a copy of Woman's World! It is so worth making a special trip for. Congratulations, Reinhard! I wish you much success and am looking forward to this new journey. (Ok, a shameless plug). I'm just here to learn how to say No to the S! I found out about the th NO-S diet from the woman's world. It was a wonderful article. I been doing Weight watcher for about 3 months now i been doing ok but i just missing something. I am going to try the No-s lifestyle with the monthy ww meeting., i will keep you posted on it. Bummer, I missed getting that issue!! Anyone care to scan a copy of the article and post it or PM it to me? I'd love to read it. I'm a lurker, so hello for the first time! But I've been following the No S principle for a few months, especially No Sugar. (Okay, I spent all of last month eating sugar on non-S days. But I've starting back up this week.) I already don't snack or have seconds, but sugar is harder for me at times. Is there a way to get a copy of the original article? Thanks for posting the article! Still love seeing our lovely Blondie on there! I wanted to go back and re-read the article that set my feet on this path. This was before my beginnings on No S. Thanks for bumping it up! Me too! And I'm so so glad I saw it. I guess this doesn't work unless you actually do it. Hey, folks! Covergirl checking after a super-long absence! I doubt anyone remembers me from the old days, but I was the Woman's World magazine cover story chick back in 2008. I'm the same weight I was when I did the shoot (and with a one year old baby!) and I really have taken the No S principles as a guide. Good for you. I saw the thread and wondered how I had missed it. I should have looked at the dates. Congratulations though, still. And, hats off to your one year old. That is FANTASTIC news. I am so happy for you and your growing family! How wonderful to grow up with a mom not burdened by the fear of food. Thank you for updating us. I run a little team dedicated to No S on Sparkpeople. a huge weight loss site that has a real bias towards calorie limits and detailed tracking. My team is going to love this! BTW, how is the knee? Did you find a replacement for running and biking? Wow. I wonder how many other diets have people dropping in 7 years after the fact to say "Hey! I've maintained. Life is good." Wow, thanks for checking in. That's a huge motivation! And I agree with Blithe.. the fact that you feel like checking in after SEVEN years is all the more reason to believe that No S 1) simply works and 2) is pleasent enough to have people come back & reporting. Congratulations Blondie. I'm happy for you! Expectation exists when there is fear. Thanks for stopping by! (and congratulations on the baby! we've had one in the interval as well). So great to hear No S is still working well for you after 7 years (and a baby! ).